Liverpool moved three points clear of Manchester City at the top of the Premier League after two sublime goals by Sadio Mane helped see off battling Cardiff City at Anfield. 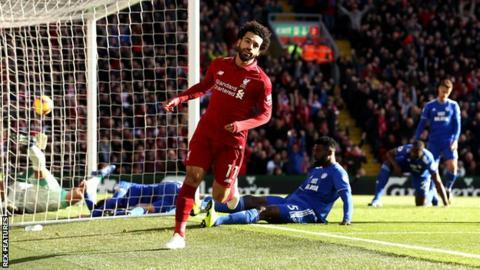 The visitors were already trailing to Mohamed Salah's sweeping finish when Mane turned a couple of Cardiff defenders before turning and finishing past Neil Etheridge. Virgil van Dijk modded against a post while Adam Lallana was denied by Sean Morrison's headed clearance off the line as the Reds dominated for long spells. Jurgen Klopp's side will stay on top until at least Monday, when City take on fifth-placed Tottenham at Wembley.